...ahh, much better! The Mossimo 'Paz' Faux-Snake Wedge is a fabulous, inexpensive alternative that costs just $29.99 at Target.com. I saw these in person and they look splendid, plus they were on sale at my local store for $21.99. ...and here's another option, which features a higher, chunkier wedge. Very hot. 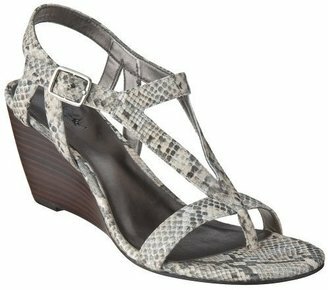 Pick up this Snake Print Wedge at Wet Seal for just $24.50. 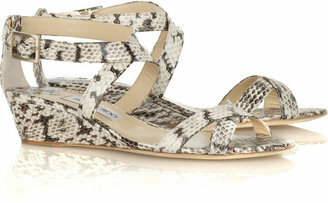 I prefer the Mossimo sandal to the Jimmy Choo. It has a gladiator style that makes it younger looking than the $700 counterpart. Great find!! check out the Macy's webbusters shoe section today..if any of you are looking for gladiator sandals..
the mossimo sandals look so comfy..i'll look around for them next time i go to target. I want that Mossimo version! Just what I'm looking for, though I do wish the heel was a bit lower like the Choos (though I'm probably in the minority for thinking that, hee hee). I have the Mossimo sandals - wore them all over Buenos Aires last month. Very comfortable and look really cute. i just brought the pair from wetseal. i'm a little younger, so i can hopefully pull them off.